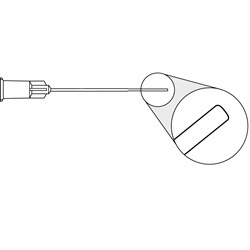 Disposable Lacrimal Cannulas are available with either straight or curved shafts. Sizes range from 19 gauge to 26 gauge. Sold 10 per box. 19 gauge tapered to 23 gauge, straight shaft, tapered 12mm from tip. Overall length: 38mm. 25 gauge, slightly curved shaft, tumble polished edge. Overall length: 28mm. 26 gauge, curved shaft, open tip. Overall length: 28mm.